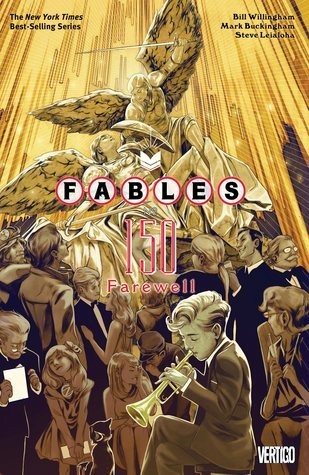 Fables 150 is a well-done conclusion to this long-running comic/graphic novel series. This is still a ‘must’ for comics/graphic novel fans, and certainly anyone who’s been following the series won’t want to miss this final issue. It’s difficult to write a review for the final book in a long-running series. This book, as a stand-alone book, probably doesn’t work well. I certainly wouldn’t recommend this to someone who’s never read a previous issue. I would, however, recommend that people interested in fantasy or graphic novels try reading this series. This is still, in my opinion, one of the most creative, original graphic novel series’ of its time. The art was consistently strong, as evidenced by the work here, and the stories complicated and engaging. Looking for a good book? Fables Vol. 22: Farewell wraps up the series with an all-star line-up of artists. If you’ve read a few, you won’t want to miss this, but if you haven’t read any, don’t begin with this ending.